Enjoy the breathtaking Arabian sunset among the dunes while being treated to an entertaining and informative 40-minute falconry display. 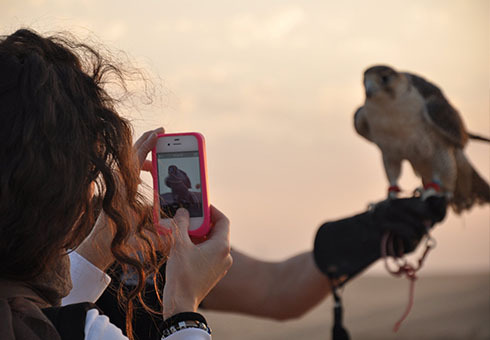 We provide an experienced falconer and a well-trained falcon. 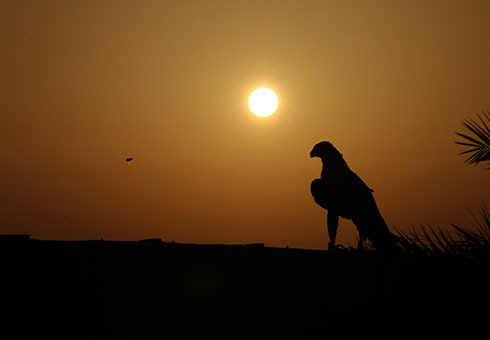 The history and significance of Arabian falconry is explained, where after the falcon is introduced. After a detailed description of the bird and its equipment, guests can marvel at the speed and agility of nature’s fastest hunter as the falconer demonstrates how these magnificent birds are trained and exercised by flying it free to a “tilwah” (artificial lure). This package is suitable for groups of up to 200 or more guests and is perfectly suited to be combined with a desert safari. Several large tour companies have used our services to the delight of their guests. Wild Flight provides one or more live falcons for static display wearing traditional equipment. The falcon is fitted with an Arabic-style “burka” (hood) and sits quietly and proudly on a “wakir” (block perch). This display is the ideal addition to any event that requires a touch of authentic Bedouin atmosphere. The falconer will be present the entire time to interact with guests and answer questions. It is also a great photo opportunity. The display can be either indoors or outside and last as long as the client requires. Personal interaction is the key phrase. During this experience guests are allowed to get up close to the birds and interact with them physically. You are provided with a falconry glove and shown how to call a bird to your protected fist for a reward. Usually several birds are flown and the highly experienced falconer explains in detail each bird’s particular traits and personality. 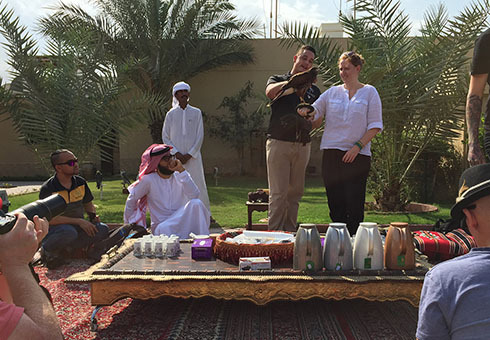 Guests will also learn fascinating information about falconry tradition in Arabia and why it represents such an important element of Emirati culture. The intimate nature of the experience lends itself to smaller groups and families. An optional Arabic breakfast buffet is also available. Copyright 2019 © Wild Flight LLC. All Rights Reserved.